The value and reliability of microbiological reports are directly affected by quality of specimens received by laboratory and length of time between its collection and processing. Specimen should reach laboratory as soon as possible or a suitable preservative and transport medium must be used. For the reliable microbiological reports, it is very necessary that specimens should be collected, handled and transported properly in laboratory. Refrigeration at 4 to 10oC can help to preserve cells and reduce the multiplication of commensals in unpreserved specimens. However specimens for isolation of Haemophilus species, Streptococcus Pneumoniae or Neisseria species, must never be refrigerated because cold kills these pathogens. It contains no growth supporting nutrients (carbohydrates, peptones or other)- The objective is to maintain viability without supporting growth of Commensal organism. Boric acid preserves urine sample for culture at room temperature when refrigeration is not possible. Refrigeration for culture can be kept up to 24 hour without specimen deterioration due to microbial growth. Apply strict aseptic techniques throughout the procedure. Wash hands before and after the collection. Collect the specimen at the appropriate phase of disease. Make certain that the specimen is representative of the infectious process (e.g. 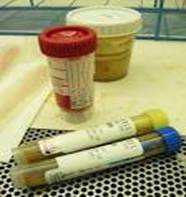 sputum is the specimen for pneumonia and not saliva) and is adequate in quantity for the desired tests to be performed. Collect or place the specimen aseptically in a sterile and/or appropriate container. Ensure that the outside of the specimen container is clean and uncontaminated. Close the container tightly so that its contents do not leak during transportation. Label and date the container appropriately and complete the requisition form. Arrange for immediate transportation of the specimen to the laboratory. Specimen collected in an inappropriate container. Thoroughly clean the genital area with soap and water. Dry thoroughly. For female, hold the labia apart while voiding urine. Discard last part of urine..
TRANSPORT OF URINE FOR CULTURING. Specimen must reach laboratory within 2 hours after collection, refrigerate at 40C for up to 24 hours during holding period and during transport. .Do not freezes. If refrigeration is not possible and specimen is delayed in transport, collect in transport container with preservative like boric acid. Specimen collection for CSF Examination Lumbar puncture to collect the CSF for examination to be collected by Physician trained in procedure with aseptic precautions to prevent introduction of Infection. The best site for puncture is inter space between 3 and 4 lumbar vertebrae ( Corresponds to highest point of iliac crest ) The Physician should wear sterile gloves and conduct the procedure with standard precautions. The site of procedure should be disinfected and sterile occlusive dressing applied to the puncture site after the procedure. Dispatched promptly to Laboratory, delay may cause death of delicate pathogens, eg Meningococci and disintegrate leukocytes. 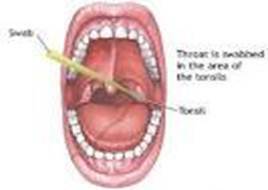 Specimen collection in throat Infections a plain cotton wool swab should be used to collect as much exudates as possible from tonsils, posterior pharyngeal wall and other area that is inflamed or bears exudates. 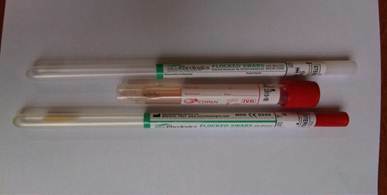 After collection swab should be placed immediately into a sterile tube or other suitable container for transport to laboratory. Swab tip be placed in a desiccant such as silica gel to suppress survival of commensal organism and improve the recovery of streptococcus pyogenes. Specimen collection in Gonorrhea an endocervical swab must be collected for examination for gonococci. A vaginal speculum must be used to provide a clear sight of the cervix and swab is rubbed in and around the introitus of the cervix and withdrawn without contamination from vaginal wall. Specimens from other genital areas other swabs should be collected from any exudate discharged from the meatus of the urethra or a Bartholin’s gland. A smaller swab with a plastic shaft and a Dacron or polyester tip is recommended for obtaining specimen. Transportation of specimens all the swabs to be promptly transported to laboratory, in cases of delay or in cases of delicate microbes to be transported in Amie’s transport medium. If possible two swabs to be collected and submitted for each site. Instruction for collecting sputum make the collection in a disposable and wide mouthed screw capped plastic container of 50 – 100 ml capacity. Collect sputum before antibiotics are given. Ideal to have when patient wakes up and with first cough. Collection of faeces the specimen may be collected from stool passed into a clean bed pan, not mixed with urine, or disinfectant or from the surface of heavily soiled toilet paper. The specimen is collected into 25 ml screw capped wide mouthed disposable container. Transportation of specimen Collect 1-2 ml of faeces, and apply the cap tightly. Take care not to soil the rim or outside of the bottle. Transmit the container quickly to laboratory. If delay is unavoidable and particularly when the weather is warm collect the specimens in a container holding 6 ml buffered glycerol saline transport medium. Collect blood during the early stages of disease since the number of bacteria in blood is higher in the acute and early stages of disease. In the absence of antibiotic administration, 99% culture positivity can be seen with three blood cultures. Small children usually have higher number of bacteria in their blood as compared to adults and hence less quantity of blood needs to be collected from them. Blood is injected into broth culture medium within one minute of collection. 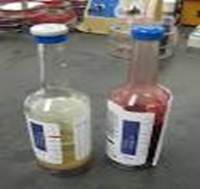 This can be held at room temperature for 4 to 6 hour safely.Inoculated and unoculated blood culture medium must not be refrigerated.All inoculated bottles are transported to lab in puncture proof containers.